Are you planning to purchase, prepare, cook, and serve the food yourself for an event? Think twice, because all that time and stress and effort could be saved if you hired a Singapore caterer. Sure, you might be able to manage catering a small birthday party or a family gathering; but for large-scale events and even mid-sized ones, catering makes the experience so much better. Find out which events are more delightful when there’s a Singapore catering involved. The last thing a new mother wants to do is cook all the food for her baby’s full month party. Even if relatives could pitch in to help with the food, their services could be better employed helping with cleaning the house, running errands, or snuggling the new little one while the young mother gets some much-needed rest. Fortunately, a full-service Singapore caterer like Eatz Catering has a wonderful selection of Baby Full Month party menus. If you’d like a themed party, set up by the catering staff, you can add that service for an extra fee. The baby full month menus range in price from a $11.80 per person to $15.80 per guest, so you can select an option within your budget. Each buffet serves 30 people, but you can expand the order if you like. The menus feature tasty dishes like lemongrass Thai fish cakes, chicken curry with potatoes, signature sweet-sour fish, deluxe mixed vegetables with straw mushrooms, and fried rice. Choose the traditional Red Ang Ku Kueh with filling appropriate for a boy or a girl, and enjoy the customary boiled red eggs in a red Chinese basket. Weddings usually involve a large number of guests at a reception venue, so it’s very difficult to try feeding all of them yourself. Instead, select an Eatz Catering wedding package. The choices include lighter tea receptions or full buffets, with a range of different menus and prices so you can select the one that works for your budget. Clients who book catered wedding packages over $1800 receive some extra benefits. They’ll have a food tasting before the event and they won’t need to pay a transport charge. In addition, Eatz Catering will provide a variety of tables for the buffet, reception line, and beverages, along with themed decorations, buffet centrepieces, and table linens. 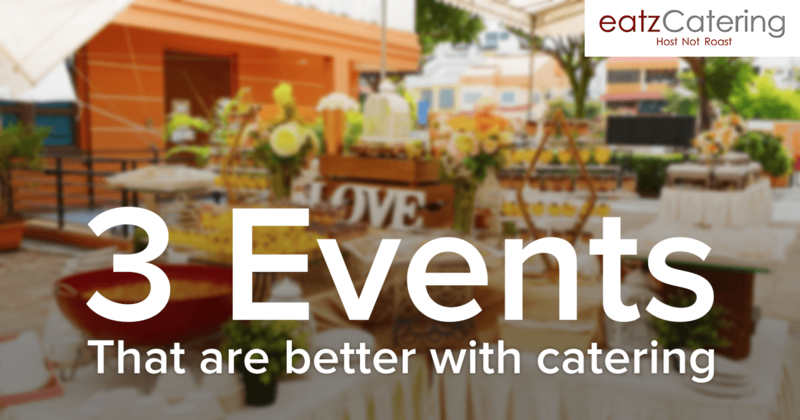 To see all the extras that come with our wedding catering packages, visit the Eatz website. For a corporate event, catering is an essential service. Whether it’s a corporate seminar, product rollout, company party, or training session, good food is an important part of the experience provided to the attendees. Eatz Catering offers economical, deluxe, and premium catering menus for full-day or half-day seminars, as well as options for evening gatherings or business lunches. For an event in the early afternoon or late evening, select a cocktail tea reception menu that will appeal to your guests. If you’d like to schedule Singapore catering service for a wedding, baby full month celebration, or corporate event, please contact Eatz Catering directly or order online. We also excel at providing food for birthday parties, family reunions, anniversaries, and special holidays such as Hari Raya, the Chinese New Year, and Christmas.